It was going to be that kind of day. The kind of day when you wake up raring to go, have the best intentions, but then nothing goes right; the kind of day where you hear the “wah-wah” sound playing over and over in your head; the kind of day where you end up spending hours on something that you thought would be so simple…like spicy roasted nuts. Never in a million years would I have thought that spiced nuts would give me the kind of trouble they did. The failed versions are crossed out and written over in my recipe notebook with descriptors like “Yuck!” and “Boo!” By far, the worst was chocolate-chipotle. The flavor of the mixture itself was very good, but once roasted in the oven, the chocolate burned and charred, leaving little black blobs where the nuts used to be. Other attempts were sadly flavorless. Nothing was working…I wasn’t happy with the egg white coating or the vegetable oil coating. Then I remembered seeing this mouth-watering recipe for Buffalo Spiced Cocktail Nuts that Carolyn at All Day I Dream About Food made, and she used butter. Of course…butter! Why didn’t I think of that?? If not for the buttery inspiration from Carolyn’s recipe, I might still be in my kitchen trying to get this recipe right. Mix together all the spices, then stir in melted butter and beer. Whisk until completely incorporated. Add nuts and fold into spice mixture into completely coated. Pour onto a parchment paper lined baking sheet. Bake for 12-13 minutes, stirring about every 5 minutes. Remove from oven and let cool on baking sheet for about 5 minutes, then transfer off baking sheet and let cool completely on parchment paper. Toss with more salt to taste. So, yes, this unassuming bowl of nuts made me crazy, but it also reminded me that when it comes to cooking, you can always have a bad day. All in all, I’m pretty lucky I don’t have more. Here's to less bad days in the kitchen! 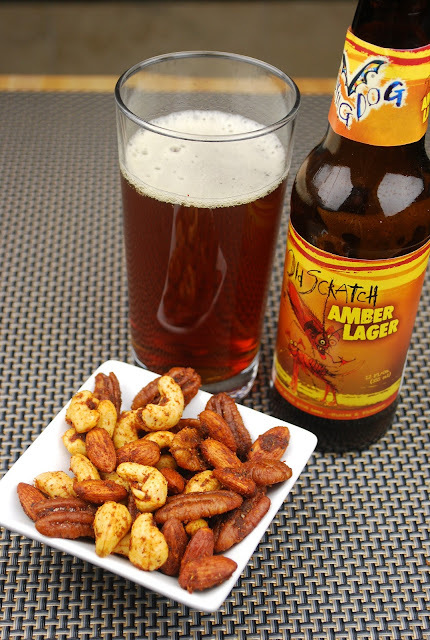 These spicy roasted nuts look great! These sure look good Karen. For some reason I was always scared of trying the egg white method. Mine is similar to yours without the beer; gotta try that next time. My nuts had best be spicy! Otherwise I find them too bland - this looks like a great version! Butter makes everything better - and these look scrumptious! It's been so long since I roasted my own nuts. Seeing your photos and recipe has brought back fond memories. I'm adding nuts to my grocery list for this week. Great photos too! I'm so glad you finally got it right...these look worth the wait! (I love Carolyn's blog, too :)). I think I'm going to have to make these for the Super Bowl. They look perfect to munch on during the game. Yeah, this is my kind of snack. DEELISH! pecans that is cook like this is a great partner with a beer! These looks so delicious. Perfect partner to beer! Thanks for sharing these on my Super Bowl munchies linky party, Karen! Love nuts...and spicy is the way to go! !